This year at CES 2018, Gibson Brands is focusing their attention on modern finishes that stand out apart from the traditionalist look. These instruments have gorgeous colors that pop and make a statement. One of our favorite interviewees at CES, Aljon Go showed us some of his favorite pieces of the new year as well as announce the newest ambassador, Slash. He also showed off the 2 Million Dollar Guitar, a guitar from the Gibson Custom Shop. Rock icon and world-famous guitarist Slash now represents Gibson Global Brands with his own line of his favorite guitars refinished to match his style and edge. These limited-edition guitars were aged to resemble their vintage counter parts that were Slash's personal favorites. Gibson is proud to have him on the team representing his relationship with Gibson along with his story. The company meets their 2018 goals with two modern beautiful pieces: the ES-335 Semi-Hollow Guitar in Aquamarine and the High Performance Les Paul Guitar in Hot Pink. These two different styles both show off a flashy color that highlights the wooden undertones. Each one has a unique design to give any modern player the look and feel that they need along with the comfortable playing style for which Gibson has always been known. 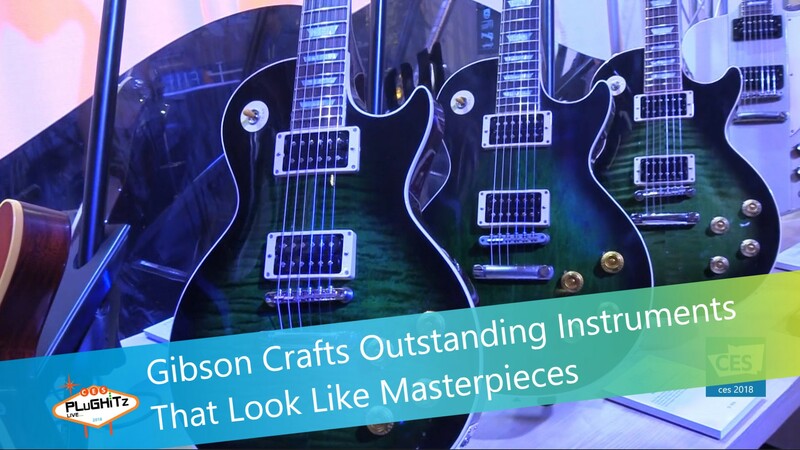 Aljon takes us over to the Gibson Custom Shop section to then show us the most expensive guitar we've ever seen: a $2 Million, hand-crafted, hand-painted, work of art that took years to finish. This guitar is one of a kind and has been kept hidden from the world for far too long. The design showcases the most iconic pop culture figures from the 1900s to the year 2000 including influential presidents, TV shows, historical figures and moments in exquisite detail. The company guarantees a guitar that you will adore specified to your style and preferred music genres. Experts like Aljon can work with you to create your dream guitar. You can find all these pieces and more by going to the Gibson website.